Apple claims that the Watch is the most personal device they’ve ever made. That may sound like marketing, but I’ve found it to be true. Your Watch comes with 10 Face types, 8 of which can be customized to fit your individual taste, style, or mood. I have found that might swap faces 2 or more times per day. So since this is a watch first, explore the faces. 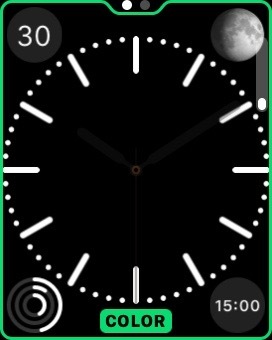 To change the face of your watch, wake the watch, then Force Touch the screen (there will be a small vibration on wrist) the swipe between the available options. Something to try for fun is from the home screen of watch, slowly zoom into each face. Apple has taken great care with the details of this animation for each different face. They're really cool. Below is a table of available faces and the customization options of each. 8 out of the 10 Faces (all but Solar and Astronomy) offer customization. These customizations come in the form form of Detail, Color, or Complications. Tap the ‘Customize’ button to customize a face. Swipe left or right to go between Detail, Color, or Complications. Adjust Details or Colors by turning the Digital Crown. Adjust Details by turning the Digital Crown. 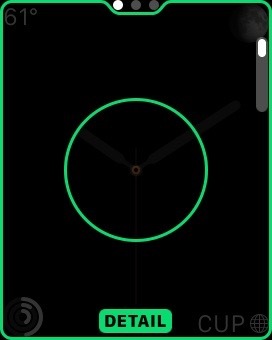 I find complications to a great metaphor for the addition of content on the watch. Of the 10 faces, 7 of them allow you to add additional information on the face. This can be anything from the current moon phase, to your Activity during the day, to the next appointment on your calendar (speaking of the next thing your calendar, don’t of forget to check out Up Next - What To Do When on the App Store). Adjust the Complications but tapping the location of the complication and turning the digital crown to change the Complication type. Complications also act as shortcuts to buit in apps. For example tapping a weather complication on a Face will open up the weather app. 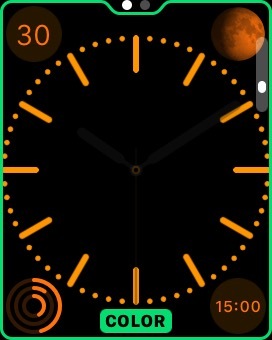 If there are any watch faces that you’re not a fan of, removing them from the list is easy. Force the face so that you enter the customization mode, the swipe over to the face you’d like to remove, then swipe up to delete it.